I’ve been keeping a secret from you guys. I haven’t said a word about one of my favorite places to eat in Charlotte. I’ve probably eaten at Kabob Grill, a Middle Eastern restaurant in the Dilworth neighborhood of Charlotte, at least 10 times, but haven’t ever mentioned it. However, you may have seen some of my delicious eats there if you follow me on Instagram, Twitter, or Facebook. 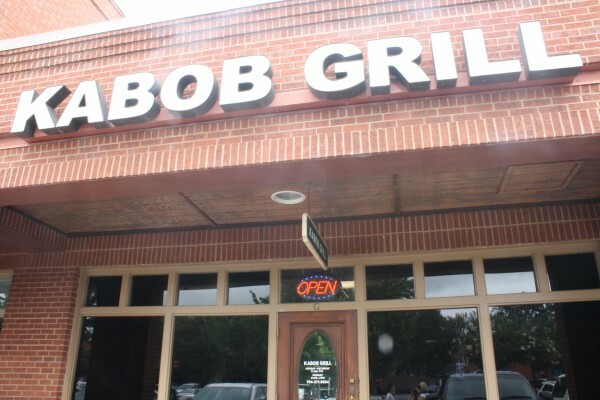 Kabob Grill also has a second location in Stone Crest in South Charlotte. Kabob Grill is in a difficult-to-notice location in the shopping center with the Harris Teeter on East Blvd. It can get pretty packed at lunch, but I’ve never actually had to wait on a table. They don’t take reservations. It’s a very casual restaurant and has a few outside tables as well. I would feel perfectly comfortable eating here in workout clothes, especially if I sat outside. But at lunch during the week, a more professional crowd is there, so maybe put on something besides running shorts. 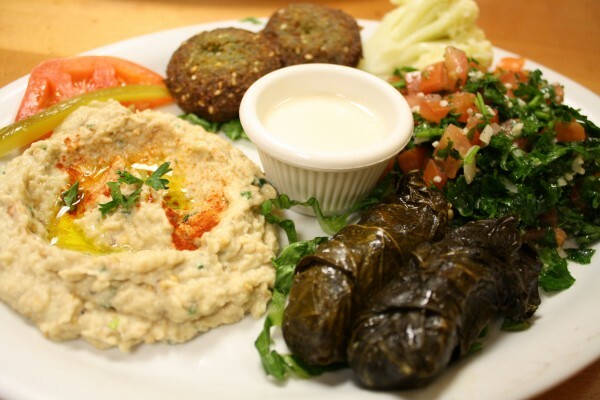 The best way to really enjoy the Middle Eastern fare, in my opinion, is to get the Vegetarian Combo where you can make a meal out of any four sides/salads. I order this almost every single time I’m there. It’s on their lunch and dinner menu. In fact, the only meaty items I’ve ever tried is the Lamb Shawerma and the Lamb Kabobs. On this particular trip to Kabob Grill, my friend Jen and I, decided to share two platters, one of which was the Vegetarian Combo because a) we couldn’t narrow it down to four sides on the combo and b) she wanted to try the lamb. I love sharing. Baba Ghannouj, Falafel (with the white yogurt sauce in the center), Pickled Vegetables (comes with almost every meal), Tabbouleh, and Yalanji. Kabob Grill has some pretty amazing hummus, which is on their menu as hommos, so we were happy to see that it came as a side with the Lamb Shawerma. The lamb could have been more flavorful and if I had to choose , I would rather order the Lamb Kabobs which were excellent the one time I tried them — flavorful, tender, and cooked perfectly. The only negative thing I will say about Kabob Grill is that I think $10.99 for a vegetarian plate is a little pricey for a lunch item. However, this doesn’t stop me from eating here often, so it obviously hasn’t deterred me. 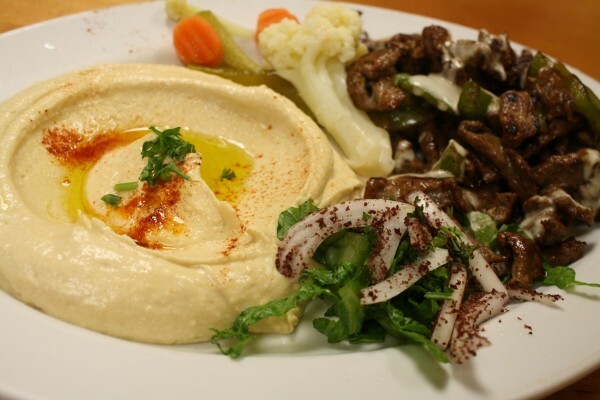 If you are a fan of Middle Eastern food, you have to try Kabob Grill. 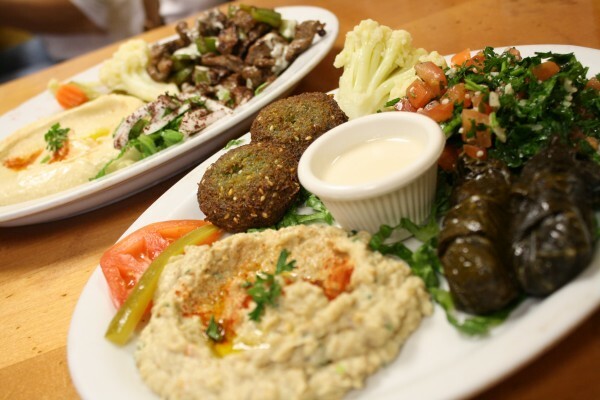 And if you’re unfamiliar with Middle Eastern food, this is a great place to try a variety of delicious dishes. Everything tastes very fresh and I’m never disappointed with my order. Is the hummus better the Zoe’s Kitchen? Theirs is my fav! I think so, but hummus is such an individual preference thing. You should definitely check it out to see if you like it more! I have been coming here since they opened. The prices were very low at first and that is my one complaint also now that they are a bit high. Still, it is so good who can resist? I still haven’t been! If you weren’t about to go into labor I would say we should set up a date to go, but between our schedules it could be difficult! Maybe we’ll go with the babies in a couple months? ?